﻿ Arrested by the Tang Police: I Refuse to Confess! Most marine aquarists who frequent online message boards have heard the term “Tang Police” (abbreviated here as TP). Some are even members of this group themselves, while a few other unlucky souls have been “arrested” by them. Conversely, there are also a few people willing to challenge their assertions regarding the swimming space requirements of Acanthurids (surgeonfishes and tangs). For those who haven’t heard the term, it will help to define the phrase “Tang Police.” The best way to identify an officer in this force is by hearing him LOUDLY express his opinions regarding the amount of swimming space required by tangs (or other species). The author, anonymous but well known to the Tang Police. 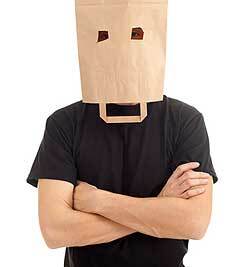 In most cases, there is the lack of finesse in the approach of these vigilantes. The TP often participate in a pile-on where an unsuspecting beginning aquarist asks about buying a Pacific Blue/Hepatus Tang for their 29-gallon tank. Multiple rude, curt and insulting responses are common, and the OP (original poster) often slinks away, very embarrassed. This is an important point. A person has every right to an opinion about how much space a tang needs, but if they don’t get in your face about it, they are not a member of the TP. Another common trait is anthropomorphizing of the issue – a TP deputy will often be heard saying things along these lines: “that tang cannot be happy in that size aquarium” or “how would you like it if you were locked into a 10-foot-by-10-foot room your whole life?” One interesting feature common to most of these opinions is the preference for giving tangs huge amounts of aquarium space, yet almost universally ignoring the swimming needs of other very active fishes such as large wrasses, fusilers, and parrotfishes. So what size tank do police members advocate for tangs? The tongue-in-cheek answer is: 50% larger than the tank you have, or they wouldn’t be confronting you about it in the first place. In reality, the message board most often patrolled by the TP does have a set of guidelines, based on personal opinions, which they loosely follow. As an experienced professional aquarist, my minimum tank sizes run about 25% smaller than those they advocate for. This is a relatively small difference, except for Paracanthurus hepatus where they suggest a minimum aquarium size of 240 gallons and eight-feet long. This is wholly unrealistic and puts most home aquarists housing this species in jeopardy of being thrown in jail by the TP. My own research shows that the minimum tank size for an adult Hepatus Tang (typical captive adult size of 11 inches) is on the order of 24 inches by 65 inches of open water space, or about that found in a typical a 150-gallon aquarium. This Neon Fusilier, Pterocaesio tile, is an open-water swimmer that needs more room than any tang, yet the Tang Police never seem concerned about it and other wide-ranging species and genera. 1) If somebody tells you for example, that a 6” fish needs a 100-gallon aquarium— that is wrong from the start. This is like saying your car gets 500 pounds to the mile. There is no way this can ever work unless you are speaking of one specific size of a fish in one size aquarium. The example I always use is that you can put 10 two-inch Green Chromis in a 50-gallon aquarium, but try to put one 20-inch grouper in there! The total inches of fish are the same, but the fish’s VOLUME goes up exponentially as the length increases in a linear fashion. Now, what DOES work is to compare the length of the fish to the open water area of the tank (length plus width). Put this into a ratio to facilitate comparisons between tanks. For example, a 4-inch angelfish in an aquarium that has an open water length of 40” and an open water width of 12” would result in a ratio of which reduces to 1:13, an adequate minimum amount of space. 2) Comparing apples to oranges is very common in these discussions. If you tell me that you want to put a six-inch long tang in a 100-gallon aquarium, I have a mind’s eye view of an open-water swimming area (length plus width) of around 80 inches. This is because a public aquarium administrator, I automatically just deduct 15 percent from the gross dimensions of any aquarium for “decorations.” A reef aquarist has a much different view of a 100-gallon aquarium (usually filled with live rock and corals). Their thought is that this aquarium has only perhaps 50-inches of open swimming room. No wonder there is a lack of agreement in some cases. So— the first step is to just work with open water area, and forget the actual gross volume of the aquarium altogether. 3) People are really, really bad at estimating the size of fish in aquariums. I performed a survey 25 years ago, in which I polled volunteers and staff at a public aquarium regarding how large they thought fish in the exhibits were. The aquarium staff did a pretty good job of estimating the size of the fish (taking into account magnification of the water, etc.) while the volunteers were all over the board, with a range of around plus or minus 80 percent. The thought here is that some people may write “six-inch tang,” but if you actually took the fish out of the water and measured it, the length might only be five inches. 4) Frequently, the FishBase web site (www.fishbase.org) is used to identify the maximum size that a fish will reach. The Tang Police then use this measurement and their opinion as to swimming room needs, to determine a suitable aquarium size. The problem is that the FishBase information is for the maximum recorded size of an adult fish. This is larger than the normal adult size for that species. 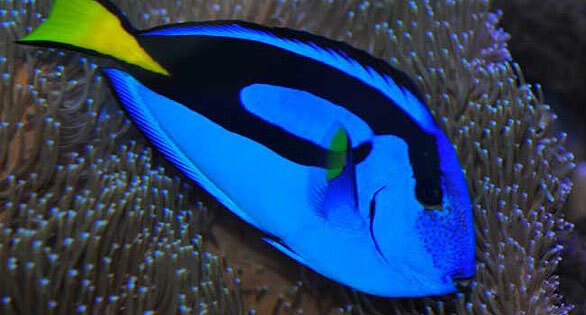 In addition, some tangs are sexually dimorphic, with “supermales” growing much larger than normal. This is not seen in captivity. Finally, captive fish do not grow as large as they do in the wild. In one study that I made, a group of adult, public aquarium fish had reached on average, only 66 percent of the maximum FishBase length. To be a bit conservative, it is probably best to use 80 percent of the maximum FishBase length as the size to which the fish will grow in an aquarium. 5) It is inherently easier to add any “buffer” to an aquarium size requirement. You cannot be proved wrong if you select a tank size that is larger than a fish really needs. The question though, is what is the minimum suitable tank size for a given species of fish? 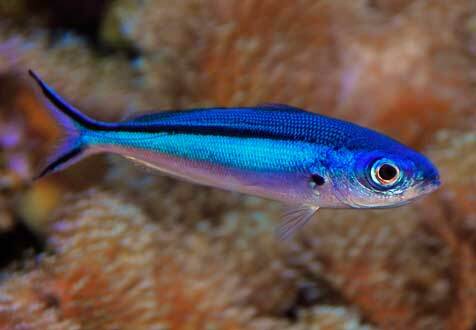 If a fish shows no artifact of captivity, (bruised snout, bent fins, shortened lifespan, etc.) then you are meeting their minimum requirements. It is often stated that the justification for giving a tang say, an eight-foot long tank is that this is more like what the fish would experience on a reef. The problem is that the biomass of fish in the ocean is on the order of one clownfish in a 20,000 gallon tank (The CRC Handbook of Chemistry and Physics gives the density of living matter in the oceans as: 15*10-8g/cm3. )—so if you want to keep things on the same order of magnitude, you better not keep ANY fish in your tank. The difference between a 75 and a 150-gallon aquarium is inconsequential compared to the potential amount of swimming room that fish have in the wild. Some species such as this Spotted Unicornfish, Naso brevirostris vlamingii, have more open-water habits and grow quite large. These DO require large aquariums. 6) As previously noted, the Tang Constabulary will frequently state: “That fish cannot be happy in that size tank”. Now, I hope they don’t mean “happy” as in human emotion, and I’ll assume that they really mean “unstressed.” So – their statement is then, that fish kept in smaller aquariums are more stressed. I spoke with a researcher who has actually measured cortisol (stress hormone) levels in wild and captive parrotfish (Turner et-al 2003). He states that after one week of acclimation, there was no difference in cortisol levels between sub-adult parrotfish housed in 50-gallon aquariums compared to those housed in 150-gallon tanks (Turner 2010, pers. comm.). When confronted with this information, one member of the Tang Police stated that this was “not a valid point because parrotfish are not tangs.” Actually, as experienced aquarists know, parrotfish range more widely over reefs than tangs do, and should therefore be given more swimming room. 7) Tangs are not equal in regards to their swimming needs. Juvenile Acanthurus and Paracanthurus are quite site-specific and do not roam widely across the reef. Zebrasoma are also more attracted to bottom structure. The members of the genus Naso and Prionurus are the true open water swimmers; they are the ones that require special consideration. Remember also that tangs are browsers, and swim widely in order to locate sufficient food. This does not equate to their wanting to do this. Many wide-ranging fish are content to reside in one small area as long as there is a good food supply (as evidenced by pelagic whale sharks congregating in small areas where the density of plankton is high). If the fish shows no signs of chronic disease or abnormality, exhibits normal feeding and reproductive behaviors and most importantly, exhibits a normal lifespan compared to that of wild counterparts (minus the predation that wild fish incur of course! ), then there is no other metric we can use to determine if a certain suite of husbandry techniques are suitable or not. So – if you have read this far, the topic must be of particular interest to you. Hopefully you don’t think that I advocate keeping fish in overly-small aquariums, as I do not. I always strive to give my captive fish the best possible environment. The exhibits I use for tangs at the public aquarium where I work range from 450 to 1,300 gallons. What I am advocating for here is a more civil discourse, more careful consideration of measurable husbandry parameters, and less reliance on subjective personal opinion. So here is the outcome of my recently being arrested by the “Tang Police” one final time, two years after my first run-in with them. I made a joke at one administrator’s expense (after he made a hugely subjective and derogative comment regarding the aquarium decision-making ability of another person). This was not a smart move on my part – he quickly brought in another forum moderator who deleted my avatar (that had been used there for over four years), they deleted messages in which I linked to outside resources, and ultimately deleted my signature line (which was a legal disclaimer regarding any opinions expressed are mine alone). Of course, I tried to change things back and this resulted in my having so many permanent infractions that I was just about to be Banned for Life. I left that particular message board for another one where the Tang Police are not given so much support. The ironic thing was that of my nearly 2,000 posts there made over 10 years, the vast majority were informational—frequently offering unique information to people having fish disease issues. So I was actually a net gain of information for their community, despite my few run-ins with the Tang Police. * C.M. Schwimm is a nom de plume, used for professional reasons. The Police will know who I am. The views expressed in this article are mine alone and do not necessarily reflect the views of my employer or the editors of this magazine. Comment received from Ronald L. Shimek, Ph.D.
Another unfortunate aspect of this whole thing is the concept of “necessary swimming space.” There are many problems with such an idea, particularly with those territorial fish that may require a large home range (large Caribbean Angelfish, perhaps Centropyge species as well and some butterfly fishes). These animals, much like some terrestrial carnivores, such as wolves, seem to patrol a large area that they know well (can identify landmarks, etc.). Such fish may definitely “need” a large surface area for normal behavior. This type of space requirement is far different from that of a non-territorial foraging fish such as a Yellow Tang – and actually, probably more necessary for those fish. Nevertheless, from the aspect of a scientist trying to investigate what is “necessary” and just “what” constitutes “swimming space” is damn near impossible to work with. It HAS to be defined separately for each fish species – and perhaps each life stage and gender of each fish species. Obviously what constitutes acceptable and useful space for a bottom-hugging far-ranging grazing/foraging fish will be very different from useful space for a primarily coprophagic clownfish fish that never ventures more than 2 or 3 meters from its anemone. Some of the things that must be considered in the evaluation of space include surface roughness, environmental heterogeneity, the amount of visual “openness” (to see potential predators), whether or not the space is found over an acceptable substrate or not, ad infinitum et nauseum. In the words of a highly quantitative microbiologist I once knew, “The whole thing is too ‘touchy-feely’ for me.” It can’t be defined, measured, or usefully discussed in the context of most aquarium fish, and certainly not tangs. At the very least, as there actually is with some of the Chaetodontids, there must be a basis of quantitative observational ecology before such a discussion has meaning. Without the forum moderators stomping this behavior out, it will continue. At some forums, such behavior was and will be tacitly encouraged by the responses of the moderators who should shut it down. But, obviously the TP can’t police themselves… so we have the question raised by Plato, and rephrased by the Roman poet Juvenal, “Quis custodiet ipsos custodes?” – which can be paraphrased as, “Who will watch the watchmen, (or who will police the police?”). All too often new and experienced aquarists are slated by other forum members, TP or not, for keeping fish, tangs or otherwise in tanks smaller than what might be the “norm” for them. I thought these forums were intended for aquarists to help each other and provide a source of information where we can all learn without getting put down remarks and comments made at them just because someone else thinks their tank isn’t big enough. In some cases the member who has had these remarks made against them instead of receiving advice will be reluctant to post again. Not a good advert for the forum/s concerned. I try really hard not to become one of the TP, but what many of these newbie queries tend to be about is not “how big a tank do I need for this one particular fish” so much as “how many beautiful fish can I cram into this space before they all die”, all of them being large tangs and angels, of course. The choice of hepatus tang in the article is a good example. How many newbies only keep one hepatus tang in a tank, plus twenty other fish they haven’t mentioned in their query? While I don’t support overt rudeness in a forum you really have to give people some slack after seeing the same query over and over and then seeing those same newbies come on the forum a month later to report a total tank wipe-out. I try really hard not to become one of the TP, but what many of these newbie queries tend to be about is not "how big a tank do I need for this one particular fish" so much as "how many beautiful fish can I cram into this space before they all die", all of them being large tangs and angels, of course. The choice of hepatus tang in the article is a good example. How many newbies only keep one hepatus tang in a tank, plus twenty other fish they haven't mentioned in their query? While I don't support overt rudeness in a forum you really have to give people some slack after seeing the same query over and over and then seeing those same newbies come on the forum a month later to report a total tank wipe-out. All too often new and experienced aquarists are slated by other forum members, TP or not, for keeping fish, tangs or otherwise in tanks smaller than what might be the "norm" for them. I thought these forums were intended for aquarists to help each other and provide a source of information where we can all learn without getting put down remarks and comments made at them just because someone else thinks their tank isn't big enough. In some cases the member who has had these remarks made against them instead of receiving advice will be reluctant to post again. Not a good advert for the forum/s concerned. Who will watch the watchmen? Comment received from Ronald L. Shimek, Ph.D. Another unfortunate aspect of this whole thing is the concept of "necessary swimming space." There are many problems with such an idea, particularly with those territorial fish that may require a large home range (large Caribbean Angelfish, perhaps Centropyge species as well and some butterfly fishes). These animals, much like some terrestrial carnivores, such as wolves, seem to patrol a large area that they know well (can identify landmarks, etc.). Such fish may definitely “need” a large surface area for normal behavior. This type of space requirement is far different from that of a non-territorial foraging fish such as a Yellow Tang – and actually, probably more necessary for those fish. Nevertheless, from the aspect of a scientist trying to investigate what is "necessary" and just "what" constitutes “swimming space” is damn near impossible to work with. It HAS to be defined separately for each fish species - and perhaps each life stage and gender of each fish species. Obviously what constitutes acceptable and useful space for a bottom-hugging far-ranging grazing/foraging fish will be very different from useful space for a primarily coprophagic clownfish fish that never ventures more than 2 or 3 meters from its anemone. Some of the things that must be considered in the evaluation of space include surface roughness, environmental heterogeneity, the amount of visual "openness" (to see potential predators), whether or not the space is found over an acceptable substrate or not, ad infinitum et nauseum. In the words of a highly quantitative microbiologist I once knew, "The whole thing is too 'touchy-feely' for me." 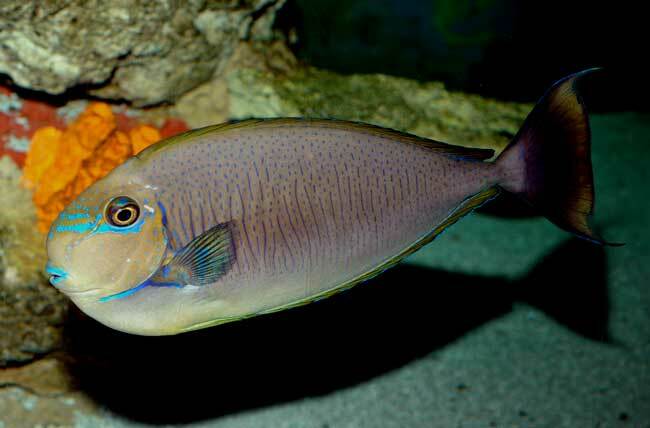 It can't be defined, measured, or usefully discussed in the context of most aquarium fish, and certainly not tangs. At the very least, as there actually is with some of the Chaetodontids, there must be a basis of quantitative observational ecology before such a discussion has meaning. In other words, it is just "made for forum misuse and bad behavior." Without the forum moderators stomping this behavior out, it will continue. At some forums, such behavior was and will be tacitly encouraged by the responses of the moderators who should shut it down. But, obviously the TP can't police themselves... so we have the question raised by Plato, and rephrased by the Roman poet Juvenal, “Quis custodiet ipsos custodes?” – which can be paraphrased as, “Who will watch the watchmen, (or who will police the police?”).